Everything changed on June 28, the day the nation was supposed to vote in a non-binding plebiscite to determine whether there was sufficient interest to begin investigating a public, participatory process of constitutional reform. A tug-of-war between the president, his supporters, the Supreme Court, congress and the army about the reform process was already underway, but few suspected that the outcome would be so harsh. When David Romero, director of Radio Globo, arrived at the station at five in the morning for his daily morning show on June 28, he saw soldiers positioned outside the station. “That caught my attention, and immediately what I thought was ‘this is a coup d’etat,'” said Romero. The first thing he did after entering the station was check what his competition — the other two corporate news channels in Honduras — were reporting, and “they were not saying anything about the coup d’état,” he said. “So I said, look, colonel, we are telling the truth. There has been a coup d’état, and that’s what we’re telling the world — that there is a coup d’état, and the world already knows that,” said Romero. Later that evening, the military stormed the station, and began removing people from the building out into the street. Romero escaped through the back window. He was back on the air the next day — but not before having been taken to the central army base in Tegucigalpa, where he was brought before army boss General Romero Vásquez Velásquez, who asked him to lower the profile of the station. Romero and his team of journalists didn’t cave to the demands of the military. Instead they continued to air live coverage of the coup as it continued to unfold through the summer and into the fall. A handful of other national media followed suit, but they were in the minority. The corporate media in Honduras got behind the coup and their backers, says Romero, because the journalists were encouraged to cover the events to serve the interests of station owners — who are among the richest and most powerful members of Honduran society — instead of serving the public interest. The attacks against Radio Globo haven’t stopped. In August, their transmitters were sabotaged, and in September, the military raided the station in conjunction with a suspension of constitutional rights and the imposition of a decree allowing the government to shut the station down. “Decree 124-2009, a measure published in the official gazette on Oct. 7th, allows the authorities to suspend any programme or media ‘fomenting social anarchy’ — and, without saying so openly, is targeted at those that oppose the coup,” said Reporters without Borders in an Oct. 21 press release. 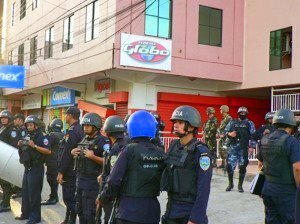 Radio Globo’s journalists turned towards the web after their equipment was seized, launching a clandestine version of the station online which has seen more than one million listeners, including more than half a million people from outside Honduras. Radio Globo journalists were back on the air as soon as the decree was lifted. Reflecting on the period since the coup, Romero says it’s been a struggle, but worth it. “If we hadn’t reported on the coup right away, we’d be like the rest of the media here — tranquil and trying to compete for second or third place,” he said. Since June, the station has seen their market share rise from seven to 28 per cent. They’ve gone from relative obscurity to international acclaim for their work, winning a prestigious Spanish award for best radio station. Most of all, says Romero, they’ve served the people of Honduras. Dawn Paley is a journalist from Vancouver who is reporting from Honduras.